Numerous ancient galaxies, previously thought to have been destroyed after colliding or merging with each other, have probably been playing 'hide-and-seek' with scientists for years, obscured by discs of 'stolen' stars from other galaxies. 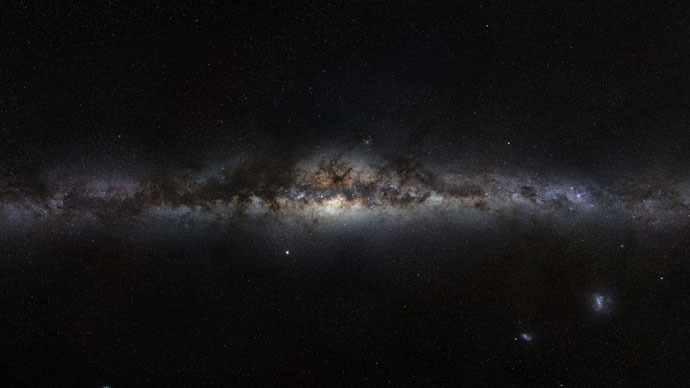 Scientists now say the Milky Way, the galaxy that contains our Solar System, may also be concealing one. In 2005, astronomers detected an array of compact spherical galaxies dating from the early universe. The galaxies (only about a third the size of similarly shaped ones in our own cosmic arena) were abundant some 11 billion years ago. Now they are almost extinct. It was previously believed that galaxy interactions were to blame for their demise. However, there were many gaps in knowledge, such as: "It was known that there are not enough mergers; this was an unexplained problem," according to Alister Graham of Swinburne University of Technology in Melbourne. "Pretty much all of the compact massive galaxies were thought to be missing from the nearby universe," Graham told the New Scientist. "Very few compact massive galaxies had been found locally, just a handful." The Swinburne scientists, led by Graham, managed to shed light on the mystery when they began to scrutinize surveys of galaxies in the local universe only to find that many had been wrongly characterized. Thorough analysis of images has revealed that as many as 21 galaxies that originally looked like "giant elliptical galaxies" - big 3D clouds of stars - proved to be flat 2D disc galaxies with bulges in the middle, according to the New Scientist. Those bulges have "exactly the same physical mass and compact size as the galaxies in the early universe," Graham stated. It basically means the majority of compact spheroids aren’t missing, but have been hiding behind a disc they grew by gathering hydrogen gas and stars from smaller galaxies. "The original, compact spheroid of stars remains basically unchanged in their centers," Graham noted, adding they were "hiding in plain sight," misleading astronomers. Our own galaxy's central bulge may once have been one of these compact galaxies, according to the scientist. There are 1,000 times more of these galaxies-within-galaxies in the local universe than previously thought, about as many as there were in the early universe, scientists believe.